As most of us know, it’s easy to make New Year’s Resolutions and it’s a lot harder to keep them. As therapists, we get to hear a lot of people’s resolutions and over the years we have seen some stick but, honestly, most fall by the wayside within two months. As humans, we all are driven by our desire for satisfaction, or as Dr. Ryan Penny of the Wellness Brothers says, “we are driven by hedonism”. Ryan and his brother, Dr. Sean Penny, have a great book out called ‘Something Bigger’, available on Amazon. In the book, Ryan talks about a battle between instant satisfaction and future satisfaction. Commonly, humans make decisions based on instant satisfaction, which ultimately derails future satisfaction. This is what happens to most resolutions. One of the reasons we give in to instant satisfaction around the time we make resolutions is because of the habits we have imbedded in the few months before the New Year. Lets face it, a lot of events prior to December 31st involve poor eating and exercise habits. Your body starts to adapt to those changes and gets used to them. Those poor choices, from the end of October on, are hard to end on January 1st without a strong mindset. 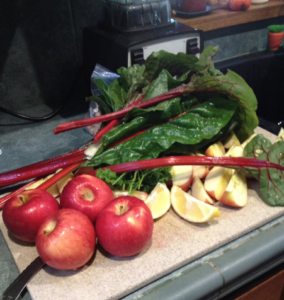 One of the things that we have found that really helps is getting into the habit of making fresh juice. Juicing has not only the obvious benefit of providing good nutrients, but it also spares enzymes in your body to do other work – like repair. When we say juicing what we mean in this article is having fresh squeezed juice as a meal replacement once a day. For those of you that want to gain weight and are afraid of losing it by skipping a meal once a day, I have personally put on muscle mass during a green juice fast – which means consuming nothing but juice. I know a lot of you are thinking “I don’t have a juicer” or “I don’t have time” or “organic produce is so expensive”…. all of those are valid points. BUT, juicers are available everywhere and it doesn’t have to be a top of the line juicer. Yes, juicing does take time, but we make fresh juice almost every day in less time than it takes to make most meals. You bet, organic produce is expensive and on some of what you juice you shouldn’t compromise (see the list below for the to 14 worst pesticide laden foods). For instance, plant a garden! We are not great gardeners and yet all year we have something in our garden to juice. Another alternative is to get your juice from one of the many juice bars, which can be found in most areas – no matter how small. In Phoenix, they are sprouting up like CrossFit gyms. These juice places are expensive and may not be in a convenient location for everyone, so we really recommend that you do it yourself. That will build a habit and give you more satisfaction. 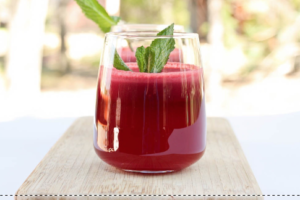 People always ask us for juice recipes and while some ingredients can help with different issues, we say, to be on the safe side and put in things you like. Dark greens have a tendency to be bitter so when you are starting out just do a little of those. Apples and carrots are great to sweeten the juice, celery is pretty neutral and lemon is a great flavor. If you feel that you need a recipe guide I would recommend Dr. Norman Walker’s book “Fresh Vegetable and Fruit Juices”. Costco carries a number of organic items. They have organic baby kale, which is much sweeter than full-grown kale and its inexpensive in comparison. They have organic apples which can be found usually around the New Year and they carry organic carrots are all year round. Sprouts Farmer’s Market Grocery Store is a good source for organic greens, celery and cucumbers. After Christmas for a few months they occasionally have organic apples for 99 cents a pound. We buy them by the case. Local farmers markets are a great place to get exceptional produce and its usually cheaper than the stores and the best part is its local, which means its fresh! Our favorite juicers are the Omega single gear masticator or the Green Star GS1000 two gear masticator. Omega is less expensive than the Green Star, but the Green Star will never wear out. Lisa and I have had our Green Star for over 10 years! Less expensive juicers, like those that have a basket that spins are typically harder to clean but can still get the job done. We have never had one by the Omega J4000 looks like a good one and we know it’s a great company. Online is probably your best bet for buying any of these juicers. Having said that check your local Craig’s list. I’ve purchased them there for clients in the past. Garage sales are also a great place to pick up a top notch juicer for a hugely discounted price. Get your kids involved. Plant a Garden. Support your local farmer’s markets. Create a sustainable habit that will make other goals appear more easily. But most importantly, HAVE FUN! !